See also: Carolinas, Separation of; History of the Dividing Line; Tennessee, Formation of; Walton War. North Carolina borders the Atlantic Ocean to the east, Virginia to the north, Tennessee to the west, and Georgia and South Carolina to the south. The state claims jurisdiction of the waters of the Atlantic to a distance of "one marine league eastward of the extreme low-tide mark." The boundaries shared by North Carolina and neighboring states were the cause of controversy and violence during the eighteenth and nineteenth centuries, and minor disagreements were still being addressed during the twentieth century. The Albemarle Sound settlements were separated from Virginia when Charles II granted the new province of Carolina to the Lords Proprietors. The provinces were divided at the 36th parallel by the Carolina charter of 1663; the Carolina charter of 1665 moved the line northward to 36°30', adding a 30-mile-wide strip to Carolina. By 1680 Virginia authorities were becoming irritated by residents along the boundary region who refused to pay their Virginia quitrents. The Virginians preferred to ignore the provisions of the 1665 Carolina charter and considered that the boundary should be at the 36th parallel, as outlined in 1663, which would place the most heavily populated districts of Carolina in Virginia. Attempts at surveying a boundary were frustrated by various private interests and objections from Virginia, which feared that a boundary survey would extinguish their claims to the land around the Albemarle settlements. Virginia even ordered a secret survey in 1705 to see how much land would be lost by an accurate survey. When North Carolina became a royal colony as the Lords Proprietors sold their rights to the province, the Crown insisted on a boundary survey. In 1728 commissioners and surveyors from both provinces began work on settling the location of the boundary. The line was begun at Currituck Inlet on 5 Mar. 1728, and 73 miles were surveyed when work halted six weeks later. Work was resumed in the fall. After an additional 50 miles were surveyed, the North Carolina commissioners left for home, declaring that it was a waste of time to survey so far inland and so far from any settlers. The Virginia party continued surveying for another 72 miles, getting as far as present-day Stokes County. The Virginian point of view of the 1728 survey was set forth by William Byrd II in his famous History of the Dividing Line betwixt Virginia and North Carolina (published in 1841). Byrd noted the plight of planters whose lands were divided by the line, "which made the Owners accountable to both Governments." He also wrote that many settlers in the area preferred to belong to North Carolina, where the grasp of the government was weak and taxes for the province and the church were lower. Further surveys in 1749 and 1779 traced the remainder of the boundary. The surveys simply continued the line surveyed in Byrd's time, with little controversy. The series of boundary disputes with South Carolina was long and bitter. The Proprietary province of Carolina was considered two separate colonies by the late 1600s, but no official boundary was specified for many years. Nothing was done to settle the location of the boundary until North Carolina and South Carolina became royal colonies. An agreement reached in 1730 called for the boundary to start 30 miles south of the mouth of the Cape Fear River and run northwest parallel to the river. Governor George Burrington of North Carolina later refused to allow funding for the survey, claiming that it would be a wasteful expense and that the Pee Dee River was a better dividing line. Had Burrington allowed that survey, North Carolina would have lost nearly all of the country west of the Cape Fear River and much of the present area of the state. In 1735, after Gabriel Johnston took office as governor of North Carolina, commissioners from both colonies agreed on a new plan for the boundary. The line was to run diagonally northwest from a cedar stake driven into the Atlantic shore to the 35th parallel, then straight west to the South Seas (Pacific Ocean), making only such detours as needed to place Catawba or Cherokee lands in South Carolina. Surveys in 1735 and 1737 brought the diagonal line beyond the settled regions to a remote meadow that was thought to lie on the 35th parallel, and work on the boundary was halted until 1764. As the lands west of the end of the 1737 line were settled, conflict between the Carolinas grew. By the 1750s, both provinces had issued grants to some of the same properties. Government authority in the disputed areas broke down as officials of one colony were arrested or driven away by authorities or residents of the other as they tried to perform their duties. Governor Arthur Dobbs later bitterly denounced South Carolina sheriffs and tax collectors in the disputed area as an "invasive force." In 1764 another survey began at the same meadow where the line had ended in 1737 and ran the boundary to the Salisbury-Charlotte road, about 62 miles to the west and at the edge of lands held by the Catawba Indians. 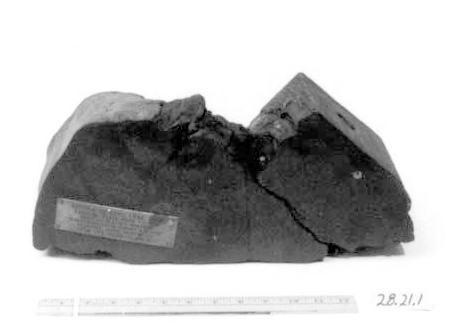 The entire 1764 survey was made in error. The terminus of the 1737 survey, which later surveyors used as their starting point, was about 11 miles too far south of the 35th parallel. North Carolina ended up with a wide strip of extra land containing more than 600 square miles. Work began on the boundary again in 1772. Surveyors, under instructions from the Board of Trade, continued the 1764 line by following the Salisbury road for about eight miles north, then cutting diagonally around the Catawba lands to the forks of the Catawba River (leaving that peculiar "notch" in the state's southern line), then running straight west as far as the Cherokee line of 1767. West of the Catawba lands, the line was run at 35°09', in effect giving South Carolina land north of the 35th parallel to make up for the territory lost by the earlier surveying error. After years of disagreements, both states finally accepted the 1764 and 1772 survey lines, reasoning that what each state lost in one survey was made up for by the other. A survey in 1815 completed the far western part of the boundary, ending at Ellicott's Rock on the Chattooga River, the meeting place of the boundaries of North Carolina, South Carolina, and Georgia. A boundary dispute between North Carolina and Georgia reached such extremes that North Carolina militia companies clashed with Georgians before the differences were resolved. Georgia had ceded its western lands to the United States and in turn received a 12-mile-wide strip of land ceded by South Carolina south of the 35th parallel. A surveying error led Georgia to start granting land in a region, named Walton County, that was legally in North Carolina north of the 35th parallel. Virtual anarchy resulted as citizens and officials of both states clashed, with neither side gaining complete control; outlaws took advantage of the lack of law enforcement, and law-abiding citizens fled the region during the so-called Walton War. It took several years before the two states could agree on the location of the boundary. The present boundary between North Carolina and Georgia was surveyed in 1819 and 1821. The 1819 survey line is slightly north of the 35th parallel and the 1821 line is slightly south of it, but both states accepted these slight variations rather than continue the quarrel. North Carolina ceded its western lands that became the state of Tennessee to the federal government in 1789. The act of cession decreed that the boundary between the two states would begin at Stone Mountain, on the Virginia line, and follow the highest ridges of various mountain ranges until reaching the Georgia boundary. A survey in 1795 plotted the boundary for 151 miles but halted when the surveyors reached some Cherokee lands. The southern section of the boundary was not surveyed until 1819. The location of much of the boundary was of little importance until settlers began moving to the area after the Cherokees were forced off of the land in that region in 1836. By that time, many of the old survey marks had been lost. There were places along the boundary where Smoky Mountain, the high ridge of which had been used to determine the location of the boundary, split into two or more ridges. Both North Carolina and Tennessee issued land grants for some of the same property in the valleys between these ridges, causing lawsuits. The Federal District Court in 1900 and 1902, and the U.S. Supreme Court in 1914, upheld North Carolina's claims in the disputed areas. In 1993, the states of North Carolina and South Carolina joined in an effort to revisit the historic surveys and resurvey their common 334 mile border using modern GPS and GIS technologies, along with historic surveys, records, and maps. Boundary issues between York County, S.C. and Gaston County, N.C. had arisen in the 1990s, prompting the two states to find a method for resolving issues related to the historic surveys without litigation. In April 1993 the NC Geodetic Survey and the SC Geodetic Survey signed a Memorandum of Agreement to co-operatively establish the boundary. Work began in 1995 with teams of surveyors. The resurvey of the entire border concluded on May 3, 2013 when the Joint Boundary Commission adopted the final 91-mile segment of the survey. As a result of the resurvey, some addresses have changed, including a change in the governing state. Legislation will be enacted by both states to resolve issues related to address and state changes for property owners affected by the resurvey. Darin E. Fields, William Byrd's Histories of the Dividing Line betwixt Virginia and North Carolina Run in the Year of Our Lord 1728: A Genetic Text (1992). Alexander S. Salley Jr., Boundary Line between North Carolina and South Carolina (1929). Marvin L. Skaggs, North Carolina Boundary Disputes Involving Her Southern Line (1933). Samuel Cole Williams, "The North Carolina-Tennessee Boundary Line Survey," Tennessee Historical Magazine 6 (July 1920). Thompson, Gary; NC Geodetic Survey. How did North Carolina Get Its Shape: A History of the boundaries surveyed. http://www.ncgs.state.nc.us/Documents/2014-09-08_History_of_NCs_boundari... (accessed November 23, 2015). Collins, Jeffrey/Associated Press. "NC, SC state line isn't where folks thought it was: 93 properties suddenly find themselves in another state." MSNBC.com. 3/23/2012. http://www.msnbc.msn.com/id/46832892/ns/us_news-life/t/nc-sc-state-line-isnt-where-folks-thought-it-was/ (November 1, 2012). Carbone, Nick. "Border Shift Between North and South Carolina Switches States for Some." Time magazine. March 24, 2012 http://newsfeed.time.com/2012/03/24/border-shift-between-north-and-south-carolina-switches-states-for-some/ (November 1, 2012). WBTV. "Dispute over North Carolina/South Carolina border." Jan 04, 2011. WISTV.com http://www.wistv.com/Global/story.asp?S=13784677 (November 1, 2012). Beam, Adam. "New SC-NC border will affect some residents." The State [S.C.]. Feb. 12, 2012. http://www.thestate.com/2012/02/12/2149525/new-sc-nc-border-will-impact-some.html (November 1, 2012). Blythe, John. "Tar Heels or Sandlappers: The NC-SC Dividing Line Settled Soon." North Carolina Miscellany (blog). February 13, 2012. http://www.lib.unc.edu/blogs/ncm/index.php/2012/02/13/tar-heels-or-sandlappers-the-nc-sc-dividing-line-settled-soon/ (November 1, 2012). "North Carolina-Georgia" North Carolina Highway Historical Marker Program. http://www.ncmarkers.com/Markers.aspx?sp=search&k=Markers&sv=Q-35 (November 1, 2012). "North Carolina-South Carolina." North Carolina Highway Historical Marker Program. http://www.ncmarkers.com/Markers.aspx?sp=search&k=Markers&sv=L-38 (November 1, 2012). Collins, Jeffrey; Associated Press. "NC and SC join to resurvey their odd state line." BlueRidgeNow.com, January 1, 2011. http://www.blueridgenow.com/article/20110101/NEWS/110109997?p=3&tc=pg (accessed November 23, 2015). Kelly, Stephen R. "How the Carolinas Fixed Their Blurred Lines." New York Times, August 23, 2014. http://www.nytimes.com/2014/08/24/opinion/sunday/how-the-carolinas-fixed... (accessed November 23, 2015). State of Sourth Carolina. State of South Carolin aBoundary Commission Report for FY2012-13. http://www.scstatehouse.gov/reports/B&CB/SC_NCBoundaryReportFY13-14Provi... (accessed November 23, 2015). North and South Carolina Boundary Survey, #2944-z, Southern Historical Collection, The Wilson Library, University of North Carolina at Chapel Hill. http://www2.lib.unc.edu/mss/inv/n/North_and_South_Carolina_Boundary_Surv... (accessed November 23, 2015). North Carolina Department of Secretary of State. North Carolina-South Carolina Joint Boundary Commission. https://www.secretary.state.nc.us/boardnotices/Board.aspx?PitemId=806478... (accessed November 23, 2015). and Other Errors Defining Our Strange State Lines." Carologue. South Carolina Historical Society: Summer 2011. http://www.southcarolinahistoricalsociety.org/wp-content/uploads/2013/03... (accessed November 23, 2015). "Pine Tree Section, Accession #: H.1928.21.1." 1570-1928. North Carolina Museum of History. 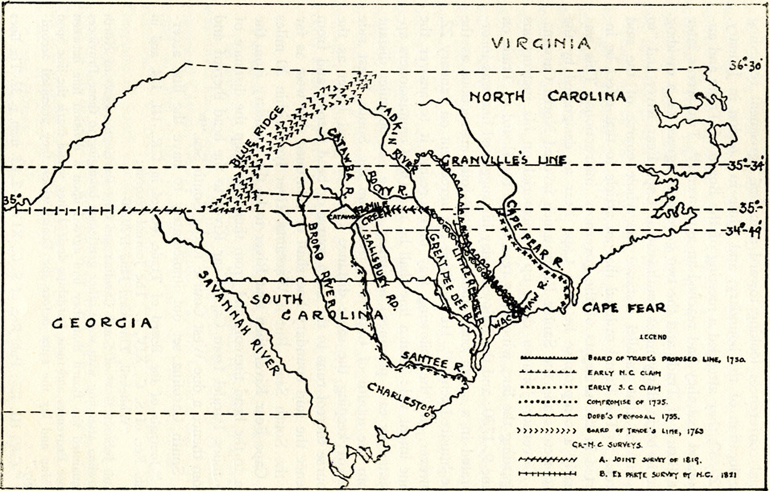 Skaggs, Marvin L. North Carolina's Boundary Disputes Involving Her Southern Line." Chapel Hill: University of North Carolina Press, 1941. WHERE EXACTLY IS THE NORTH CAROLINA/GEORGIA LINE NEAR LOW GAP ROAD IN HAYESVILLE NC?? ?